Upon analyzing the bomb, the FBI discovered that it bore the trademarks of a mysterious bomber they had been tracking for nearly fifteen years. Because his chosen targets were university professors and airline officials, they had taken to calling him “UNABOM.” Since 1978, he—it was presumed that he was male, likely an academic or an intellectual, possibly a blue collar aviation worker—had mailed or placed fifteen bombs. Some failed to detonate properly, and their intended targets came off unscathed. (One such bomb, planted on an American Airlines flight from Chicago to Washington, D.C., would have killed all one hundred fifty passengers on board had its timing mechanism not malfunctioned.) Others lost fingers and suffered severe burns or nerve damage. Besides Mosser, the only other fatality so far had been Hugh Scrutton, the owner of a computer store in Sacramento. Based on seven-year-old testimony from Scrutton’s secretary, the only eyewitness in the case, the police circulated a sketch of Mosser’s presumed killer: a mustached man of indeterminate race, his face obscured by aviator sunglasses, a hood covering a crop of curly hair. From the beginning, the apparent lack of motive behind the attacks proved a major stumbling block for the Bureau. But, as it happened, “The Unabomber” provided the explanation himself. In a letter to The New York Times the following April, he wrote: “We blew up Thomas Mosser last December because he was a Burston-Marsteller [sic] executive. Burston Marsteller helped Exxon clean up their image after the Exxon Valdez incident.” (In actual fact, Mosser was not connected to the Exxon Valdez incident. He had been misidentified by an environmental newsletter.) “Burston-Marsteller is about the biggest organization in the public relations fields. This means that its business is the development of techniques for manipulating people’s attitudes.” UNABOM’s anti-technology position was expounded more fully that September in a 35,000 word essay called Industrial Society and Its Future, which was published jointly by The New York Times and The Washington Post after another bomb killed timber industry lobbyist Gilbert Murray. “The Industrial Revolution and its consequences have been a disaster for the human race,” began “the Manifesto,” as it was referred to in the press. “They have greatly increased the life-expectancy of those of us who live in ‘advanced’ countries, but they have destabilized society, have made life unfulﬁlling, have subjected human beings to indignities, have led to widespread psychological suffering and have inﬂicted severe damage on the natural world.” By hastening the onset of the breakdown, the Unabomber argued, we might reduce the extent of the disaster. And while it was impossible to know what way of life would follow after the collapse, whatever it was, it would have to be better than the world we live in now. As the FBI hoped, the publication of the manifesto led to the capture of the Unabomber in 1996, when a social worker named David Kaczynski recognized the writing as that of his estranged older brother, Ted. The elder Kaczynski, the press soon learned, was a Harvard graduate and brilliant mathematician who had given up his position as the youngest faculty member at Berkeley to live in a cabin in the Montana wilderness. His arrest photo showed an unkempt man with wild eyes. Doctors for both the defense and the prosecution claimed, upon examining him, that he suffered from paranoid schizophrenia and that his fears of technological oppression were “non-bizarre delusions.” Accordingly, Kaczynski’s views received little serious consideration in Time, Newsweek, or any of the nightly news broadcasts covering the case. As far as the media was concerned, he was yet another in a line of violent separatists that grew longer with each passing year: the Branch Davidians, Randy Weaver, Timothy McVeigh, Eric Rudolph—all ordinary citizens who hit the eject button on mainstream society just as Wall Street, Silicon Valley, and the pharmaceutical industry promised to spackle over the last cracks in the American edifice. It is safe to say that, despite public “concerns” about Internet privacy or the international legality of drone assassinations, the technological optimism of the nineties has grown, not lessened since Kaczynski was last in the public eye. After all, Twitter and Facebook toppled the Mubarack regime. And WikiLeaks has ushered in a new era of government transparency. And new media has given any American with access to a computer a voice in the public sphere. Nonetheless, with the memory of the nineties’ domestic terrorism wiped from the public consciousness by the attacks on the World Trade Center, the last ten years have seen something of a re-evaluation of his ideas. Kevin Kelly, the editor of Wired Magazine, has published a much discussed article crediting the Unabomber with his analysis of technology as a “holistic, self-perpetuating machine.” The novelist William T. Vollmann, who was himself briefly on the UNABOM suspect list, has written approvingly of Industrial Society and Kaczynski’s isolationism. Meanwhile, on the far right, Keith Ablow, author of The Psychology of Casey Anthony, took to the Fox News website this summer to denounce the narcissism of social media and wonder whether the Unabomber might not have been onto something. (“Kaczynski, while reprehensible for murdering and maiming people, was precisely correct in many of his ideas.”) Even the art world has taken notice. Kaczynski is the subject a recent film by James Benning, and his collected writings are now available for purchase at the New Museum on Bowery Street. The book, published by Feral House, comes with a strident introduction by Dr. David Skrbina, a non-tenured professor of philosophy at the University of Michigan. On its cover is a photo of one of Kacyznski’s bombs, uncovered and waiting to explode. All of which raises, once again, some hard questions. Like whether Kaczynski’s alienation from American society was a rational response to an increasingly catastrophic society or the result of inner turmoil and poor socialization. Or whether his reasons for murder can be taken as cogent philosophical principle. Then there is the big question of whether it is possible to sanely and credibly murder in service of a humanitarian cause—a dispensation usually reserved in America for institutions, not individuals. Now these difficulties are joined by still harder questions about his supporters, and by extension, us. What does it mean, morally, that ideas held by many educated Americans have led to murder? In short, what does society want with a man who wants nothing to do with society? Unlike the lives of most famous murderers, whose ordinariness generally offers an ironic counterpoint to the grisliness of their acts, Ted Kaczynski’s life can genuinely be called exceptional. Born in 1942 to second generation Polish immigrants in Chicago, it quickly became clear that Ted was an exceptional child. At the age of ten, his IQ was tested in the 160-170 range. As a result, Kaczynski skipped the sixth grade and began high school one year early in suburban Evergreen Park, where the family had relocated. Academic success failed, however, to win Kaczynski any friends among the student body. Evergreen Park High School had only opened the year before, and since the students had all attended different elementary schools, they hardly knew one another. Two years younger than his classmates, standing a diminutive five foot one, Kaczynski found it difficult to make lasting personal connections. Apart from a brief burst of popularity following his building a pipe bomb in chemistry class, he spent his days by himself, nursing an increasing antipathy for the administration and the student body. Kaczynski’s life at home, as he recalled it, did little to make up for the lack of emotional sustenance he found at school. His parents, he felt, cared more about having a brilliant son than whether he was happy and fulfilled. In his many journals, as well as in two unpublished autobiographies, Kaczynski paints his mother and his father as cold, distant, and emotionally abusive—though it is difficult to reconcile these claims with Kaczynski’s admission to his court-appointed psychiatrist, Dr. Sally Johnson, that in most respects his parents were unselfish and generous. The pain Kaczynski felt ran deeper than school, deeper than home. The materialist values of The Greatest Generation filled him with a murky, bottomless rage. In response, Kaczynski developed a socially impracticable moral system to justify his anger, a system so isolating he could not communicate it to anybody. What he wanted, he told Johnson, was something to justify the intense contempt he felt for others. Understandably, his contact with girls was limited. Despite Kaczynski’s resentment towards the academic pressure placed on him, he arrived at Harvard eager for an opportunity to develop himself outside the constricting atmosphere of suburbia. “I got something I had been needing all along without knowing it,” Kaczynski wrote of his college days, “namely, hard work and the strenuous exercise of my abilities. Feeling the strength of my own will, I became enthusiastic about will power.” But by the end of his first year, Kaczynski felt even more alienated than before. Instead of being placed with the rest of the student body, he found himself in a monastery-like house for gifted freshmen, where the housemates often went weeks without seeing one another. The university’s patrician environment did little to make the shabbily dressed, lower middle-class Kaczynski feel welcome. He found himself entertaining fantasies of becoming a violent revolutionary, or of living a primitive life away from society. He had terrifying dreams in which a white mist turned his teachers into hideous old men. Harvard also provided Kaczynski with the first of what would be many unfruitful encounters with the psychiatric profession. During his sophomore year, Kaczynski participated in a series of tests conducted by Dr. Henry A. Murray, a professor in Harvard’s Department of Social Relations and a former employee of the Office of Strategic Services. (Later, the OSS would be reconstituted as the CIA.) The goal of these tests was to break down and restructure the “abnormal” personality that Murray felt was going to lead to industrial society’s collapse; in practice, they were little different from the interrogations he had conducted for the Navy during World War II. Told that he was going to debate the merits of his life philosophy with a talented young lawyer, Kaczynski found himself in a brightly lit room with a camera recording his facial expressions and electrodes measuring his vitals. Instead of a debate, the interrogator viciously mocked Kaczynski’s beliefs and aspirations, making reference to an account of his life Kaczynski had been asked to write mentioning intimate details like toilet training and masturbation. Murray also administered a full range of arcane psychological tests: the Maudaulay Personality Inventory, a “time-metaphor test,” a Wyatt finger-painting test, a Rosenzweig picture frustration test. Neither the student movement nor politics in general held much interest for Kaczynski. Generally, he found that reading the newspaper filled him with anger and frustration at the politicians, the businessmen, the scientists, the Communists—not just for their misdeeds, but for their very existence. Thirty years later, in the “Criticism of Leftist Psychology” that opens Industrial Society, Kaczynski would write, “The leftist of the over-socialized type tries to get off his psychological leash and assert his autonomy by rebelling. But usually he is not strong enough to rebel against the most basic values of society.” The hippies confused hedonism, the first principle of consumer society, with freedom. What was more, in Kaczynski’s mind, they misunderstood nature. Nature was not communal, it was not egalitarian. It was brutal and hard, unlike civilization, which was numbing and deadening. Living in nature meant ceaseless toil—self-directed, willfully performed toil, but toil nonetheless. Kaczynski did not hold his position for long. After two years of half-hearted teaching, during which time he left little of an impression on his students or his fellow faculty, he abruptly resigned. With the money he had earned, along with some supplemental money he made working for his father’s foam cutting company, he was able to buy 1.4 acres of land southeast of Lincoln, Montana, near his brother David, who was working at a smelter’s in Great Falls. With David’s help, he built himself a cabin, and in 1971, he relocated to Montana. Although Kaczynski was a skilled outdoorsman, he had never lived in the wilderness before. He was, despite everything, a boy from the Chicago suburbs. The cabin that was now his home was one room, ten feet by twelve, heated by a wood-burning stove that covered every surface with soot. When Kaczynski had to relieve himself, he went in a hole he had cut into the floor. In winter, the temperature could drop down to forty below. At night, the darkness and silence were absolute. From time to time, he went into town to collect the small stipend his parents sent him, borrow books from the public library, and to mail his increasingly voluminous and paranoiac correspondence. But he was, for all intents and purposes, alone. Though he was finally free of suburbia, and free of academia, and free of advertising and technology, in those moments when he wanted a modicum of human warmth, when he wondered if he might have made a mistake by severing himself from society, there was no one. And while he had removed anything from his life that might set off the anger inside him, there was now nothing to check it either. Jacques Ellul’s 1964 book, The Technological Society, a favorite of Kaczynski’s, advances the argument that the technological system that determines our society has no center, no hierarchy. Two hundred years ago, it was possible to lead a revolution into the palace, march the king up to the guillotine, and institute a new order. But technology, Ellul argued, has no such center of power. No one person determines its logic. Efficiency is king; everything and everyone submits. Though he wholeheartedly endorsed the book’s anti-technological views, Kaczynski disagreed with Ellul about the effectiveness of violent means. Not only could the proliferation of technology be deterred, Kaczynski felt, but it was incumbent on him to take action. Nonetheless, the tortuous logic and naked personal resentment motivating the attacks Kaczynski carried out from 1978 until his arrest in 1996—to say nothing of their complete inefficacy—bear out Ellul’s point. The first bombs were sent to Northwestern, which had rejected one of Kaczynski’s first anti-technological manuscripts. The crude construction of the bombs caused them to misfire, and they caused only minor injuries when opened. The next bombs had the aim of silencing the airplanes that destroyed the quiet over Kaczynski’s retreat. One bomb, placed on a flight from Chicago, Kaczynski’s hometown, to Washington, D.C., the seat of technocratic-political power, failed to go off; another, sent to Percy Wood, the president of United Airlines, sent him to the hospital with cuts and burns all over his body. That done, Kaczynski turned his attention to the distribution end of the technological network: hence the first fatality, Hugh Scrutton, a Sacramento computer store owner, and Gary Wright, another computer store owner in Salt Lake City, who sustained severe nerve damage to his left arm. The rest of the victims were either professors at Berkeley or the University of Michigan or chosen, like David Gelernter, author the pro-technological fantasia Mirror Worlds (and, more recently, America-Lite: How Imperial Academia Dismantled Our Culture and Ushered in the Obamacrats), through occasional and highly selective reading of The New York Times. During this time, Kaczynski was compelled to take up writing as well. His first entry into the public sphere was a letter to The New York Times after the Gelernter bombing, followed by another clarifying Mosser’s killing. Seeing that they had been published, Kaczynski realized that it was now his responsibility to set forth his ideas such that an ordinary American could understand him and, if he were captured or killed, carry on with his project. Over four months, he worked furiously to produce his magnum opus. Industrial Society and its Future is not, as both the prosecution and the defense in Kaczynski’s crimes claimed, the work of a paranoid schizophrenic “not playing with a full deck.” Its main argument is clearly and, apart from the detour on leftist psychology, concisely expressed: personal freedom is constrained by industrial society, which serves no purpose except to promote technology’s growth. Any attempt to reform society or to use technology to promote freedom inevitably reinforces the technological order. (One might think here of the bad faith of Apple’s famous “1984” commercial, which casts buying an Apple computer as an expression of individual freedom and an act of political rebellion.) Therefore, humans must push industrial society towards its inevitable self-collapse. Undoubtedly, Kaczynski’s life has been one of incredible pain, pain that his bombings exponentially compounded. None of Kaczynski’s supporters address this aspect of his biography in their accounts of him; nor do they confront the ramifications of his acts. The high-principled “humanism” of Skrbina and Zerzan and Lydia Eccles’ 1996 “Unabomber for President” campaign hides the same distaste for people as they are and the same indifference to the value of an individual human life they impute to technology itself. What an article coyly titled “The Unabomber Was Right” not so secretly suggests, regardless of the argument it advances, is that human beings are stupid and slavish and herd-like, taking momentary pleasure for true happiness and hailing their servitude as though it were their freedom. They are, historically speaking, beyond redemption, and if somebody were to take matters into their own hands and fill them with razor blades and shrapnel, it would be their own fault. Two hundred fifty years ago, civilization’s most eloquent hater, Jean-Jacques Rousseau—another naturalist and paranoid letter writer—wrote in the preface to his play, Narcissus, “It’s true that people will be able to say one day, ‘This avowed enemy of the sciences and arts nonetheless wrote and published plays’; and that comment, I admit, will be a very bitter satire, not on me, but on my century.” A similar observation might be made of an age that finds educated, well-to-do Americans praising a murderer for his moral clarity and a man serving four life sentences at ADX Florence supermax with fellow terrorists Ramzi Yousef, Eric Rudolph, Terry Nichols and, until his execution, Timothy McVeigh, as a paragon of individual freedom. This desperation for somebody, anybody who has managed to break free of the web of compromises and complicities that is life in a highly industrialized society is hardly surprising when one considers just how total technology’s grip on our world has become in the seventeen years since Kaczynski’s arrest. Today, most Americans carry on their person an interactive, individually customized computer that orders their private and their public lives, their work and their play—assuming these distinctions still hold. They communicate with friends, relatives, co-workers and strangers through systems organized by multi-national corporations that collude with advertisers and the government to surveil them. Psychiatrists have reported an increasing incidence of patients who wake compulsively during the night to check their data and their messages. The least that can be said for Kaczynski is that he went as far away as it is possible to go. Then, when that did not prove far enough, he crossed over to the last principality from which one might credibly claim to be “against” society—evil. If Kaczynski is the best alternative we have, things must be desperate indeed. 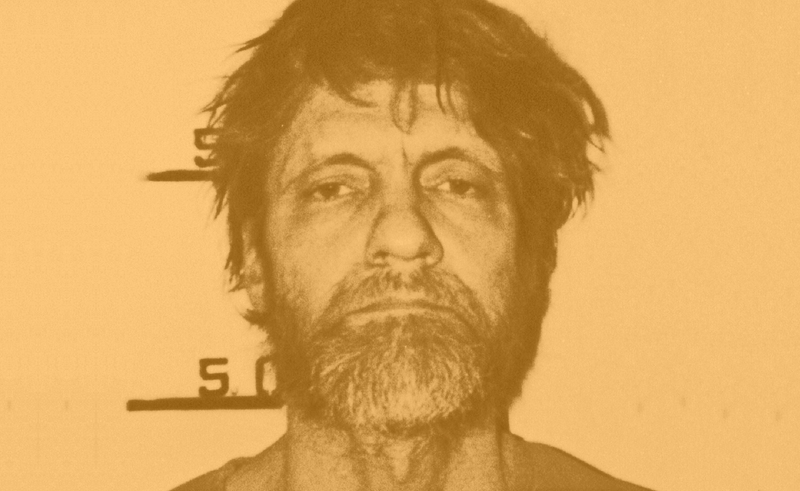 Not a few of the articles that flirt with Kaczynski’s ideas suggest, as did Time Magazine in their coverage of his trial, that there is a little Unabomber in all of us. The claim seems modest enough. Which of us has never felt that, no matter how far up the ladder we climb, our lives will never be our own? That happiness will always elude us? Even so, just the opposite is true. Kaczynski is now a seventy-one year old man whose sole access to the nature he once loved is through a four-inch wide window. Insofar as he has a legacy, it as a reminder that pathological extremism is only the shadow side of the half-hearted moderation he railed against, and that solutions to the social problem need imagination, cooperation, and above all, humanity—the very resources technological society leaves in such short supply.